TIme for more charity streaming! Last year, a group of Philly-area cosplayers and streamers raised several hundred dollars for Child’s Play by playing Ratchet and Clank… as Ratchet and Clank (and Nefarious). On Saturday, May 13th, starting at noon Eastern Standard time and going until… they either finish the game or y’all stop throwing money at Able Gamers, an enclave of Philly-area personalities will be streaming Danganronpa: Trigger Happy Havoc, a visual novel by Spike Chunsoft. They won’t be doing it in character/costume this time (well, some will be in cosplay), but they will be dubbing the game live! Join Delaware, New Jersey, and Pennsylvania cosplayers, voice actors, and streamers, including Ark of CATV, Failshane, Starrysprite, Coldguy, Rodinosaur, division-ten, and a few other surprises as they screech and fumble their way through school life (and deadly life!) for your amusement. Your headmaster and master of ceremonies, played by yours truly. A natural thing to ask! Other than the warm fuzzy feeling of donating to an awesome charity doing awesome things, a donation through our donate button keeps that timer going to watch us make fools of ourselves- the money goes straight to AbleGamers, but the button lets us keep track of money our stream has earned, for raffle prizes as well as donation goals- we don’t touch the money at all, and it’s still tax deductible for you, if you so choose. You’ll also get to vote on who the group romances/spends time with during Free Time in game- if you decide to throw a buck or two our way- sorry, Monocoins are not accepted currency. Oh yeah, you didn’t think you’d walk out of this empty handed did you? Here’s just a sampling of what’ll be up for grabs- cosplay props like Hajime’s and Kuzuryu’s cosplay ties. Pins and buttons. 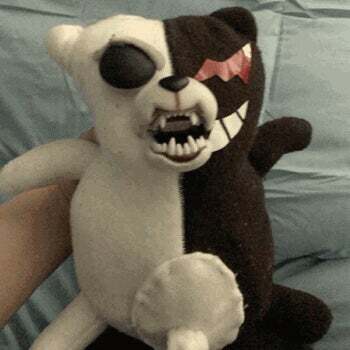 Monokuma plushies. A PS4 copy of the game. Yes really. And anyone in the continental USA that donates $50 or more gets a handmade Hope’s Peak high school bag in whatever color combo you want (we’ve got silver-on-black in the picture, but you’ll get to choose). Yes, every. If you have a US address to send it to and you donate $50- you get a bag (sorry international people, shipping just costs way too much, but if you have a US PO box or something, that counts)! We’ll also raffle off a bag or two as well, and that’s for anywhere. These aren’t official and are not in any way associated with Spike Chunsoft, but are being handmade just for the event, by our intrepid team of Ultimate Cosplayers. We can also make them without glitter, but why would you want it that way? For any die hard Dangan fans, we have a special prize to raffle if we reach our donation goal of $1,000- we’ll be raffling off an animatronic Monokuma from division-ten, a cosplayer featured last year on Extra Credits, which you can check out right here and below.. This one-of-a-kind custom plush animatronic talks, blinks, moves, is utterly frightening… and could terrorize your family if the stream makes enough for Able Gamers. So put on your school uniform, tell us your ultimate skill, and get ready for.. MURDER!